One bowl, healthy Paleo pumpkin bread made with coconut flour, natural sweeteners and wholesome ingredients for the perfect fall treat. 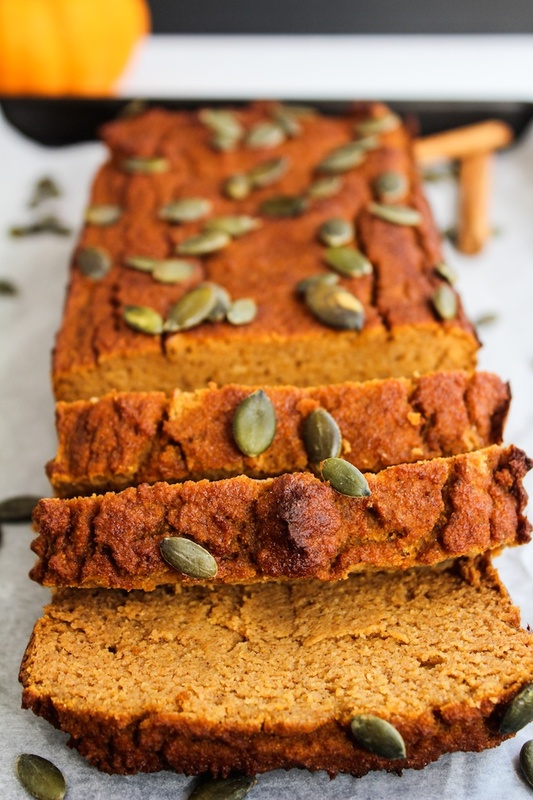 Let’s all take a moment to appreciate October and all its autumnal based deliciousness with this Paleo pumpkin bread. I’ve got a thing for quick breads. They’re quick, easy, reliable, and always delicious. I usually end up making banana bread of some variety based off of the chocolate cinnamon recipe I’ve shared with you all. I’m pretty sure my mother in law always makes sure that we have a healthy stock of bananas in the hopes that I make banana bread when they go overly ripe. No complaints here! Now that it’s October, pumpkin bread just feels mandatory. I get a lot of enjoyment out of waking up to a slice of this bread and a cup of coffee. It’s perfectly moist, generously spiced and not to mention gorgeously colored. 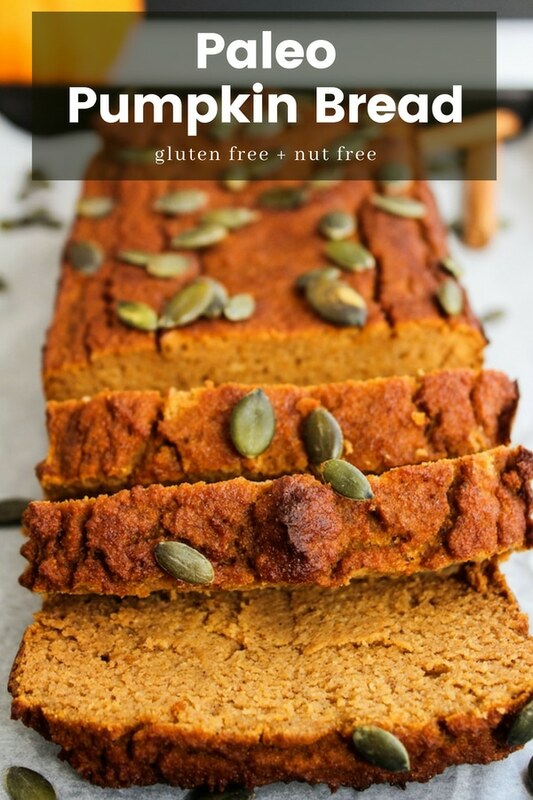 Not only is this pumpkin bread grain free and refined sugar free, but it’s nut free as well. When it comes to Paleo baking I usually rely on almond flour over coconut flour. I love the taste and texture of almond four, but I do not love the price. I also don’t love the fact that nuts are such a common allergen. Since we’re no strangers to food allergies here in our house, I love sharing recipes that can be enjoyed by most people. While there is no such thing as a completely allergy free recipe, this is recipe is nut free, dairy free, and can be made low FODMAP and/or SCD depending on which sweetener you choose. All in all, I’d say this Paleo pumpkin bread is perfect for sharing…and also hoarding to yourself because it’s too good to give away. Your choice! 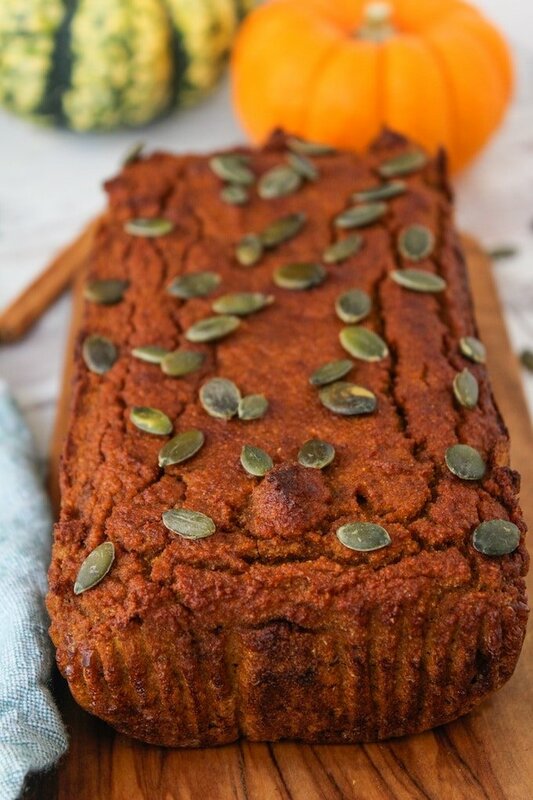 Don’t forget to #asaucykitchen on instagram if you try this paleo pumpkin bread! We love to see what you make with it! You can also post your pictures to our facebook page! Beat the eggs in a medium sized bowl. Add the vanilla, honey, and oil to the eggs, mixing thoroughly. Add the pumpkin puree and mix until you have a smooth batter. Add the coconut flour, baking soda, and all of your spices to the pumpkin batter and mix until combined making sure that you have no lumps in your batter. Grease an 8x4 inch loaf pan, or line with parchment and scoop your batter into the pan. Sprinkle on a small handful of pumpkin seeds. Place in the oven and bake for 45-50 minutes, or until a knife going into the center comes out clean. Cool and serve. An 8x4 inch loaf pan is recommended for taller pumpkin bread. You can use 9x5 inch which is also common but the bread will come out wider and lower. Hi Kimberly! I’m so glad you liked it – thanks so much for coming back to let me know what you thought! As for the loaf size I did use an 8×4 inch pan. I’ve used 9×5 before so I totally know what you mean about it looking squatty. Thanks for coming back to ask about that – I’ve just made a note in the recipe about pan sizes! I LOVE this bread! I’ve been making it once a week for over a month now to have with my coffee in the mornings. I have a bit of a sweet tooth so I double the maple syrup and add three or four finely chopped dates. I also read the reviews about cooking temp/time so I lower my oven temp to 325 and cook for about an hour, maybe a little longer. The pumpkin seeds on top give it a great look. It’s a pretty easy and inexpensive bread too, compared to a lot of other recipes I’ve looked at. Thanks for the great recipe, it’s awesome! Off I go to make another loaf! I love your idea of adding chopped dates here for added sweetness! Definitely going to try that! Thanks so much for coming back to let me know how it went & thanks for sharing your adaptations – I always find it really helpful knowing what works for others! I just baked this, today. After reading the comments, I adjusted my oven temperature and the baking time. I am delighted with the outcome and shall bake some more, tomorrow. Thank you for sharing the recipe. I’m always grateful when anyone goes through the tedious process of creating a recipe and being kind enough to share it. Thank you again, this will surely be enjoyed countless times this season. Hi there – despite being in uk I’d got my hands on some pumpkin purée so was keen to try this as I’m dairy free . Mine did cook through and looks like your picture … but I think it needs to be a little sweeter so if I was making again I think I’d add more maple syrup and some coconut sugar ? You could try adding a little more sweetener if you’d like! I wouldn’t add too much more maple syrup though – maybe another 1-2 tablespoons at most because then it might end up being a little too moist. One thing – I do find that my bread usually tastes a little sweeter on the second day, but that might just be me. Thanks for coming back to let me know how it went! First time making this today and it turned out great. I’m really happy to have found this recipe – shall definitely make again. That’s wonderful! TI’m really glad you enjoyed it! Thanks so much for coming back to leave a comment/review! I have yet to find a paleo pumpkin bread recipe that doesn’t come out soggy. This recipe proved to be the same – only the edges are cooked, leaving the rest of the loaf almost raw. I left it for an extra 20 mins and still have uncooked bread. Help! What am I doing wrong? Hi Callie! So sorry it hasn’t worked out for you! There could be a couple of things that had an impact on the bread. It could be that the oven doesn’t distribute heat evenly. I know I’ve had problems in the past with baking when I’ve used ovens that have random hot spots – parts of my baked goods would be over cooked and others would be left raw. One thing you could try in the future would be to reduce the oven temperature down to about 325 and cook for a longer time at a lower rate. At least that way the outside edges wouldn’t cook too much faster than the inside. I wish I could be there in the kitchen with you to help figure it out – I hope this helps a little bit! In general, I have better luck using a muffin pan. Hello! Would it be possible to use coconut sugar in place of the honey or maple syrup? I have some in the pantry I’d like to use up. Thanks! Hi Dee! I’ve yet to try this with coconut sugar, but I think it would work. You may want to increase the amount of coconut sugar by an extra tablespoon or so because honey/maple are much sweeter by nature. It may not come out as moist as the original recipe, but I think you’ll still be alright. Hope that helps! Hi Leonie! Thanks for pointing this out to me! When I look at it from the back end (where I can edit/post things) everything looks fine. I think I might have accidentally changed something recently that made the recipe go funny on the front end. I’m fixing it now. In case you still need it: it’s supposed to be 1/2 cup coconut flour. Thanks again for letting me know! I cannot find the measurement for the flour… I think I’m losing it! Got 3/4 through the recipe and and winging it on the amount. Hope it comes out! Hi Lane! I’m so sorry that that happened! I think I must have changed the coding recently on the post to make the ingredient list go like that. On my end everything looked fine, so I had no idea. I’ve fixed it now, but I’m sure you’ve already finished at this point. I’m very sorry if you ended up wasting ingredients without the proper amount. Thank you for letting me know so I could fix it for other people! Thank you for this recipe! Got it in my inbox and just HAD to make it right away. Actually my first Paleo bread attempt and it turned out awesome! Florida hasn’t figured out it’s fall yet, but I have! Could I use brown rice flour instead of coconut flour? Made this and loved it! Family members who aren’t gluten free liked it too! That makes me so happy! I love it when gluten eaters enjoy gluten free foods – totally makes my day. Thanks Melissa! I LOVE all the natural ingredients in this bread! I could totally use a slice right now to go along with my coffee. I’m visiting from Wonderful Wednesday Blog Hop – congrats on being featured! Guilt free and perfect for the season! Thanks for sharing. We love having you at Thursday Favorite Things blog hop. Your pumpkin bread is delicious, love this paleo version, thanks for sharing with Hearth and soul blog hop, pinning and tweeting. Your Pumpkin Bread is just beautiful! Hope you are having a great weekend and thanks so much for sharing with Full Plate Thursday. Thank you so much, Kaila! I love banana bread, but pumpkin bread is just amazing. I think the fact that it’s seasonal and is tied to so many fall emotions makes it even better, ya know? Great finding your blog too, btw! I love pumpkin bread and can never have too many recipes to try, your paleo version looks wonderful! Thanks for sharing at What’d You Do This Weekend?! Thanks, Joy! I agree – there are never too many pumpkin bread recipes! Love this paleo recipe – pinning ot make this weekend! Happy to meet you via SITS! This looks amazing, definitely pinning for later! Love all your fall things 🙂 Fall is really the best! 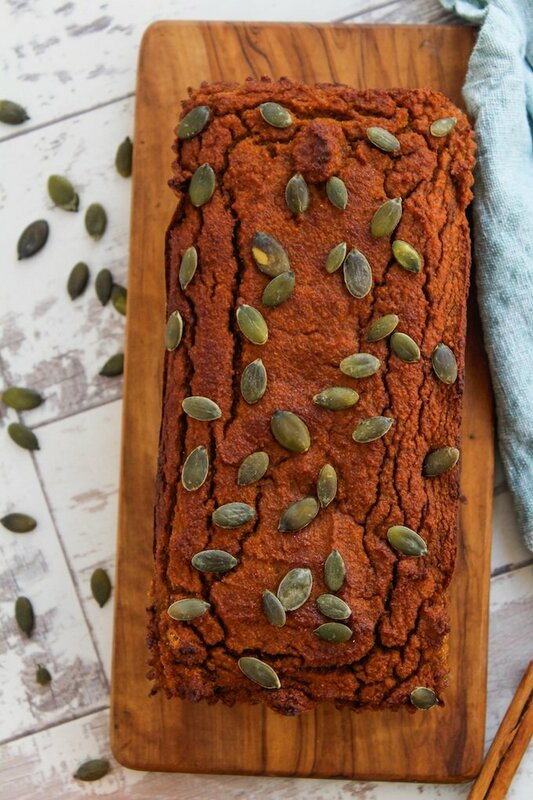 This pumpkin bread looks amazing, love the toasted seeds on top! Thanks for sharing with the Wednesday Showcase! Thanks, Cristina – I really do love fall and all it’s amazing baking goods! This pumpkin bread looks scrumptious Sarah! Would love slice with my morning coffee! Your bread looks yummy, and I am loving October, it brought cooler temps and rain. Thanks for stopping by #OMHGWW this week! I’m right with you on the list – I love fall, especially here in the Central Valley, nice to see the temps dip a bit! Your pumpkin bread looks delicious! Thanks for sharing with us at #TryaBiteTuesday – pinned & shared. Hope to see you back next week! We’re totally banana bread lovers in this home too but what better time than October to try something with pumpkin? This is perfect! Thanks Sarah! This bread looks delicious! I love that it’s grain-free and especially that it’s made using coconut flour because I have a crazy-enormous bag of it in my pantry and I’m always looking for new recipes to use it in! Yay for October!! Yay – I’m glad you’ll be able to put that coconut flour to use 🙂 Thanks, Stephanie! Thanks, Johlene! Gotta love October!